Crafting Adventures: Some Odd Girl.....GDT.....Little Project! Happy Monday everyone! Life seems to have returned to warp speed for me at the moment, so please excuse the sporadic posting! Unbelievably, this madness is totally caused by the fact that I've booked a week off work next week. It just seems daft that I will probably end up working stupid hours this week, just to have a week off next week! Anyhow, enough moaning....!!! I have a special little project to share with you today. As you know, I am guest designed with Some Odd Girl for the month of February. When she offered me the GDT spot, Kristy asked me to make 1 extra special project. This got me thinking (and panicking!) right away and I started prowling around the house, looking for something to alter. Then I stumbled across a boring, black A5 folder that has been unused, gathering dust for the last couple of years. A plan was cunningly hatched.....! As I always seem to be watching my weight (NOTE: I don't eat particularly bad stuff, I just have portion control issues!) 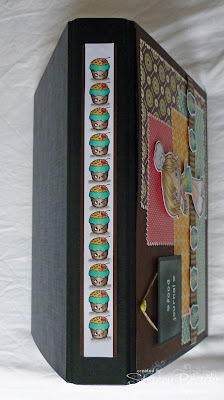 I thought it would be a great idea to make a little food journal so that I can jot everything down. I figured that if it looked pretty, I might be a little more inclined to make use of it. Baker Kaylee seemed the perfect choice for this project, even if she is tempting me to eat muffins! I also decorated the spine of the folder using a SOG cupcake which I resized and repeated to make a little border. I thought this might help to make my folder stand out when it is stored on a shelf. Stamps: Baker Kaylee and Cupcake - both Some Odd Girl. Paper: October Afternoon - Fly a Kite. Copic Markers: E00, E02, E11, E41, E43, E47, E49, E50, R20, R22, R27, R29, YG03, YG63, YG67, BG13, BG15, BG23, BG49, Y21, Y26, YR23, W1, W3, W5, W7. 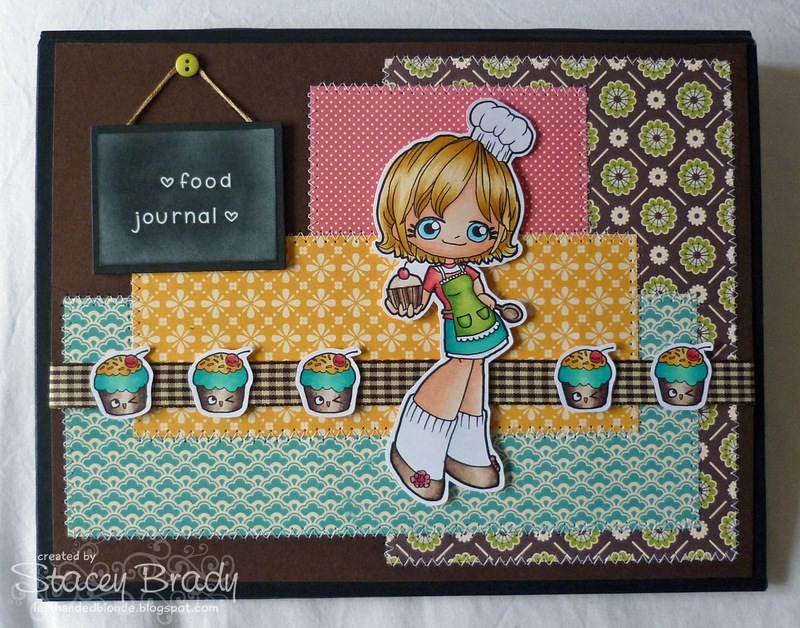 Tools & Embellishments: Doodlebug rub-ons, Nesties, sewing machine and ribbon from stash. I hope you enjoyed seeing my little project. Make sure you nip over to Some Odd Girl to check out their fantastic goodies.... there is even a sale on! 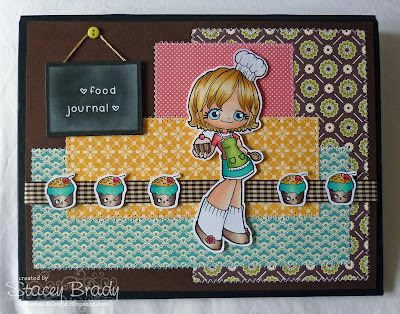 This is sooo adorable Stacey, WOW LOVE this design!!!! FABULOUS! so adorable and such a great idea!